Moving into a new home always comes with some stress. That stress may be magnified once you’ve decided to move yourself or a loved one into a facility where they can receive more assistance and care. That said, moving into an assisted living or long-term care facility doesn’t mean giving up the comforts of home. But the move likely will require you to make some decisions as you relocate into a different, and possibly, smaller space. 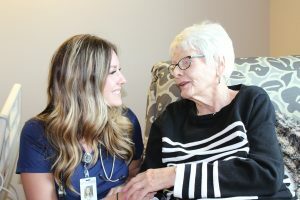 She encourages residents moving into assisted living or a long-term care facility to take their time in determining what they want to bring with them. Eventide’s assisted living residences are unfurnished apartments, meaning new residents bring their own furniture, furnishings and personal items. Space for those items depends on the square footage and layout of each apartment. (There are one-, two- and three-bedroom units plus 14 different floor plans). If you or your loved one uses a scooter or walker, make sure that there is enough space to store it and to maneuver around the apartment. You may have to limit furniture to make sure there are clear pathways. Some bedrooms may accommodate queen- and king-sized beds while others are better suited for a full-sized one. If you’re not sure, ask the facility. If you want a dresser in the bedroom, ask if there will be room for it. Bring your favorite rocking chair or recliner. If you prefer to use an electric lift chair, be sure you know how to use it safely. Bring small tables, decorations and blankets to make it feel like your space. Area rugs may make an apartment more homey, but they can also be a tripping hazard. Consider leaving these behind. If you’re determined to bring one, make sure it lays flat and the edges are taped down. Take into consideration space needed for medical equipment. Be sure that oxygen tubing is secured or placed where it isn’t a tripping hazard. Ask yourself what services will I (or my parent) need in six months? Planning for these needs when you first move in can make things easier down the road. Tougher decisions need to be made when you or a loved one move into a long-term care community. The rooms are smaller and more space is needed for caregivers and medical equipment. Everything in these rooms is provided except clothing and decorations, but there are still ample opportunities to personalize the space. While toiletries are provided in long-term care, some residents prefer to bring their own. A CD player or small radio. Photos of family, friends or treasured memories. A Chair. Recliners are provided in Eventide’s rooms, but some residents prefer to use their own. Items that reflect one’s hobbies or interests. Residents often decorate their doors with flowers or sports memorabilia so they can easily identify their room. One resident displayed a model ship outside his room. “We encourage residents to bring something that says, ‘This is my spot. This is just for me,’” Sjaaheim says.